When I arrived at the venue ~ 12:30 there was no one there that looked like they had anything to do with the talk. 15 minutes later I still saw no signs of either other spectators or the arrangers. Shortly after two women from the publishing house showed up and opened the doors to the auditorium. When Cory Doctorow came in the door, there was only me, the two women who worked there, and one more spectator present. If I had been the only person who wasn’t there because I was paid to take care of him, I guess Cory Doctorow would’ve excused himself and done something more important, like working on the two books he’s in the process of finishing, or some of the other thousand things he does. And rightly so. What can we do to prevent a future reminiscent of the one described in Little Brother, where our human and citizen rights are taken away even more so than they are today as a natural evolution of the path we’re already walking? How do we get more people aware of these dangers, and how do we make them care? I’ve been following the piracy/copyright debate closely for quite some time, but it’s nothing compared to you. Even though I see how important this is, and I’m personally engaged in it, I find myself tiring of it. You have to keep up with every minute detail, year after year. Don’t you ever get sick and tired? What else do you care about? Do you ever wish you could work on some of those issues, but you just don’t have the time? I would not use the iPod because of its tie-in with Apple’s DRM and because of its almost monopolistic stranglehold over the «mp3-player» mindshare (and thus the market) (and because I don’t want to give money to a company that works so hard to lock in their users). Even though you’re one of the greatest fighter we have for digital rights and freedom, and even though there are very many better alternatives (quality- and price-wise at the same time) in the pocket-jukebox market, you still use the iPod. Why is that? Can you say anything about the movie based on Little Brother? ETA, studio, will it have famous actors, anything? Update: Since Little Brother is a book that partly is about teaching how to use todays available technology to circumvent the surveilance society, will you update the book as new technology develops? At the debate that same night the place was packed (as I said), and Cory held a great talk. Again I knew most of what he had to say, but it’s always good to be reminded, and you can’t help but being captivated by Corys talks, no matter how many times you’ve heard the facts. After the event he told someone that he had learned from Lawrence Lessig to give the same talk over and over again, so he can practice it and make it better. Lessig knows what he does, for his talks are renowned for their greatness. Panel with Doctorow, Newth, Kalsnes, Buset. Licensed under CC BY-SA 2.0 by NRKbeta. The debate wasn’t all that good, but I don’t think anyone expected it to solve the problem (even though Cory tried to at the end), and Eirik Newth and Bente Kalsnes came with some good points that made it worthwhile to listen to. I can’t say I was very impressed by Bjarne Buset, the representative from Gyldendal, one of the largest publishing houses in Norway. He was quite clearly on the other side of the debate from Doctorow, though far from as bad as the RIAA and MPAA. Afterwards Cory Doctorow stayed for an amazingly long time, and I stayed and chatted with more nationally important (and very nice) people like Thomas Gramstad from EFN, the Norwegian equvilant of EFF, Martin Bekkelund from the Norwegian Open Source Competence Center, a couple of people from FriBit, Espen Andersen, Eirik Solheim from the Norwegian public broadcaster NRK, and lots of other great people. Update: Lastly I must give huge kudos to Samlaget for translating the book, but at the same time I can’t help but being mad at them for not including the afterwords or (more importantly) the literature list. That was a very important resource for those that want to learn more, and we need kids that learn more about these things! It would also’ve been better if the translation was Creative Commons-licensed. Others writing about the book, the gig, or the man in connection to this (Norwegian): Klassekampen, TU (Anders Brenna var selvsagt tilstede og kommer med et intervju med Doctorow senere), NRKbeta, Dagsavisen, Aftenposten Si;D, NRK. Le Monde har en sak som ikke handler om Doctorow, men likevel tar opp opphavsrett, overvåking, osv. og er veldig akutell. This entry was posted in English, Internett, Kultur, Opptak, Piratvirksomhet, Politikk, Rettigheter, Samfunn and tagged Cory Doctorow, digitale rettigheter, drm, Little Brother, opphavsrett. Bookmark the permalink. 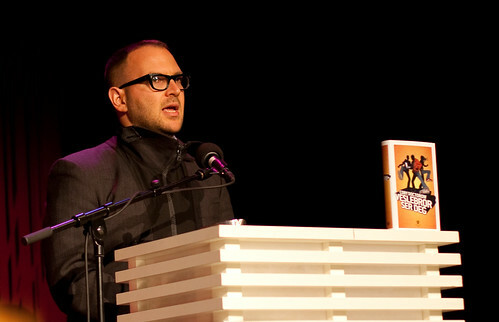 Here are the @forteller audio recordings of @doctorow when he was in Oslo: http://bit.ly/MQoEX & a chat http://bit.ly/19wig4 Video 2 come.